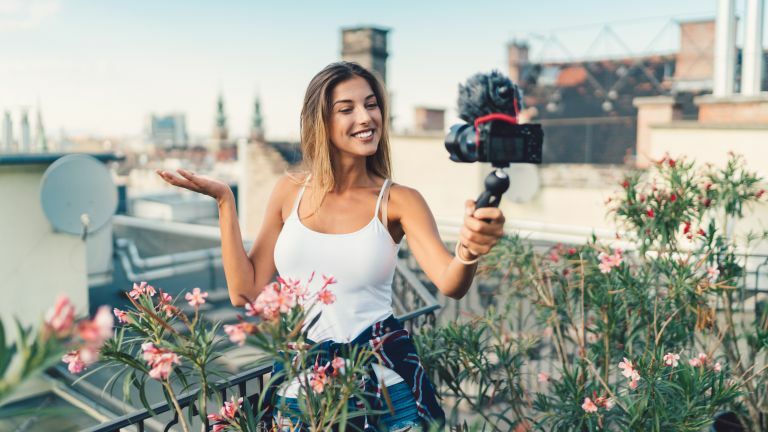 Vlogging, the highly visual and often more captivating moving picture alternative to writing a standard blog, is big business these days. And, even if you don’t aspire to hit the headlines with your latest posts, having a decent camera to score quality video is essential. Anything less than crystal clear footage will see you pushed aside in favour of folks who’ve really given it the beans while securing their shots. So having 4K quality as part of a camera specification is cool, but not essential, especially if you’re posting to Youtube. All of the suggestions we’ve got here will provide you with perfectly serviceable video in a variety of formats. You can even get away with shaky footage if that’s in context with what you’re aiming to do. So, for example, adrenalin junkies can benefit from having edgy shots that show off just how far you’ve gone to secure your pictures, shakes ‘n’ all. Alternatively, if you’re looking for silky smooth footage that suggests you’re a consummate professional then today’s best vlogging cameras can help you out big time. So, whaddya need to get up and running? Should you buy a DSLR, compact or mirrorless camera? Our best vlogging camera buying guide aims to give you a quick overview of the best of the bunch. Unsurprisingly, it’s the biggest camera brand names that get the nod, simply because they’ve honed their models over time, with the likes of Canon, Panasonic, Sony taking prime position in our listings. However, it’s not just about the camera – if you’re looking to capture great audio then seriously consider adding an external microphone onto your shopping list. A shotgun-style model is ideal for vlogging and they come in at a price point to suit any budget. They’re way better than most built-in mic options and offer very directional recording, whilst fending off wind noise and other aural intrusions. As for having a shop window to show off your vlogging talents then set yourself up with a YouTube account if you don’t have one already. Instagram is also the go-to location for lots of footage fans, who frequently want a quick fix of video while on their travels. In fact, mobile visitors could prove to be the cornerstone of your success simply because so many people spend time watching vids while travelling or doing the daily commute. We’ve got a selection of models with specifications to suit a variety of needs, but don’t forget to pick through them all as features vary from model to model. They’re all great for different reasons though. Compact and lightweight, it’s easy to see why the Canon PowerShot G7 X Mark II is a vlogging favourite with its 1080p capability. It boasts a versatile lens, flip touchscreen and a beefy battery. An improved processor delivers high performance even in low light while the body is perfectly suited to shooting on the move. The only downside is there’s no external microphone port. This 30.4-megapixel full frame camera is a real bruiser with a mighty DIGIC 6+ image processor that delivers 4K video with ease. It’s pricey but can be mated to Canon lenses for capturing professional high-end video and, in that respect, should let you enjoy reasonably future-proof use for a good few years. The dinky Sony RX100 IV is compact but it’s beautifully made as well as packing 4K, albeit limited to 5 minutes along with slow motion recording. The powerful sensor and processor combination makes it wonderfully responsive, while the diminutive design and built-in lens means it’s easy to shoot a vlog pretty much anywhere. The Panasonic GH5 is the tool of choice for many a filmmaker and it’s ideally suited to vloggers too. Performance is sublime, there’s 4K, 5-axis dual image stabilisation plus unlimited recording time. It’s splash, dust and freezeproof while the feature set is comprehensive. It can be paired with a raft of different lenses too. The GoProHero6 action camera lets you record up to 4K from pretty much any kind of vantage point including yourself, someone else or anything you can mount it to. It’s very robust and waterproof down to 10 metres without an additional housing, plus there’s a 2-inch touchscreen display for easier use. Looking for another angle for your vlogging? The DJI Mavic Air is a superb foldable and hugely portable drone that has 21 minutes of flight time and can deliver 4K footage from above, via a silky smooth 3-axis gimbal. It also comes packed with tech that makes securing quality video a real cinch.